This year, one of the most inspiring recipients of the MacArthur Fellowship is an agriculturalist named Will Allen. His non-profit, Growing Power, maintains an urban farm in Milwaukee, providing fresh vegetables to the residents of the distressed inner city there. Regular readers here will note that I have a strong interest in urban agriculture and small-lot permaculture, so it is especially rewarding to see the MacArthur Foundation take interest in the kind of project that Will Allen is leading. The New York Times published a great article about a month back on Will Allen and Growing Power and MAKE magazine has the video of an interview with him. HeavyPetal has a quick HOWTO on plugging shiitake logs. Her version includes the cheese wax step, with picture, which I didn’t bother with, so I highly recommend checking her post out. My guide to plugging a shiitake log is, of course, here. Last year, I had to have a dying hickory in my yard cut down. While I paid to have most of the trunk hauled off, I still have a pile of the limb wood. I had decided a while back that I would plug these logs with shiitake spawn and make shiitake logs. Its best to do the plugging after the last hard frost, so I waited until yesterday to do the work. I ordered my plug spawn from Fungi Perfecti, a neat company near Olympia, WA. 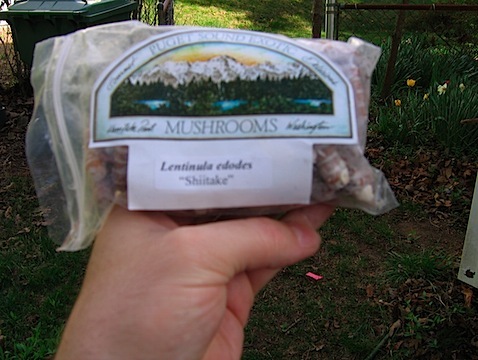 They’ve got spawn for lots of different strains of mushrooms, but I love shiitakes and shiitakes love hardwoods. 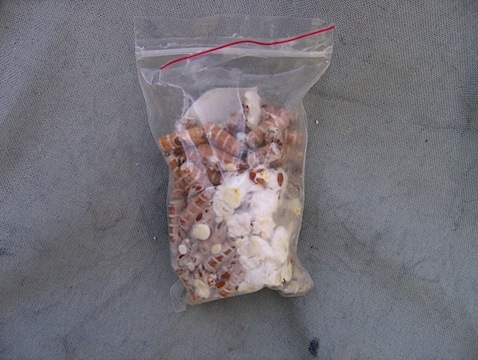 The spawn arrive in a little bag like the picture on the right. The spawn themselves are small dowels, about 1.5″ long, with a spiral groove cut into the side. You can clearly see the white mycelia from the shiitake in the groove. There is also some grain in the bag as well, which I surmise are how the dowels were inoculated. I had ordered my spawn about a month ago, so by the time I pulled the bag out, there was plenty of mycelial growth in the bag, which you can see in the picture on the left as the white matting around the dowels. According to the instructions, this is normal and probably wouldn’t have been so bad if I’d used the spawn more quickly. Fortunately, no mushrooms had begun to bud, so I didn’t have to pull those off. When I started my small garden plot last year, I was appalled at the state of the soil. Looking back at the blog post, I didn’t say much about it, but I recall loosening the soil and discovering a thin layer of topsoil over greasy red clay. I worked some leaf compost into the plot and went from there. I also noticed that in digging up the roughly 80 square feet of garden, I found only a couple of earthworms. At the end of the growing season last year, I seeded the plot with crimson clover as a green mulch and leaf mulched the swiss chard in hopes of having some of it survive the winter. This spring, when I started planting, I noticed that the soil seemed much healthier – black and a bit deeper, and nicely crumbly. Most excitingly, when I was digging up some of that weird 6-leaved running ground cover that had crept in from the edges, I found that I couldn’t lift a spade of soil without turning up at least one earthworm. Fantastic!